After the US Army announced that it had selected a new camouflage uniform, finally selecting the replacement for its pixelated camouflage outfits, known as the Universal Camouflage Pattern. The reason was simple that those outfits did not work and now the replacement uniforms which are a version of older uniforms are coming. In 2004, the Army adopted the new patterns in the hopes of improving invisibility, but that failed pretty bad, the new pattern may have made troops more visible. So 6 years later in 2010, the Army launched a competition to find the next generation of camouflage, but no one won the competition as reported by Gizmodo and the Army went for the self-designed pattern; under the contract from a company that had designed the stopgap camouflage after it was discovered the UCP designs did not work. The Army had that self-designed pattern since 2002, meaning, essentially, everything that happened afterwards never needed to. “The biggest one is the claim (oft-repeated) that it was a $5 billion waste. That’s not true because people conflate the purchase of uniforms and equipment with the camouflage effort. They are different. For instance, the vast majority of that amount refers to the purchase of uniforms which were used, worn out and discarded during the time period which is referred to. So that was not “wasted” money. People got their use out of that gear. There WAS money spent on development of camouflage, and that, of course, is a sunk cost. But that is a matter of several million dollars, not $100 million, and certainly not $5 billion. 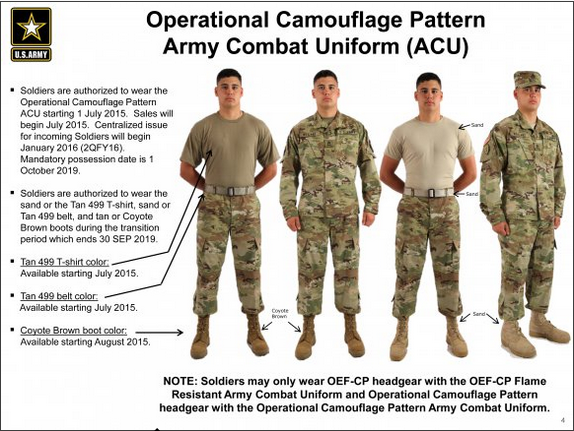 The new uniforms will be named “Operational Camouflage Pattern Army Combat Uniform (ACU)” are ready and comes with two T-shirt variants, TAN 499 and Sand and they will be sold in military clothing stores across the United States on July 1st and the possession will go mandatory October 1st, 2019. Thank you Gizmodo for providing us with this information.